Directed by Colin Trevorrow and executive produced by Academy Award® winner Steven Spielberg, one of the biggest movie franchises of all time gets even bigger with Jurassic World. 22 years ago, John Hammond envisioned a theme park where guests could experience the thrill of witnessing actual dinosaurs. Today, Jurassic World welcomes tens of thousands of visitors, but something sinister lurks behind the park’s attractions: a genetically modified dinosaur with savage capabilities. 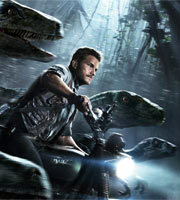 When chaos erupts across the island, Owen (Chris Pratt) and Claire (Bryce Dallas Howard) race to restore order as a day in the park becomes a struggle for survival. Please Note: This film was originally programmed to include Open Captions and Audio Description. Due to unforeseen circumstances, this will now be a standard screening. We apologise for any inconvenience this may cause.